World Cup expansion plans got even bigger Monday, and the 2026 tournament could have 48 teams playing instead of 32. 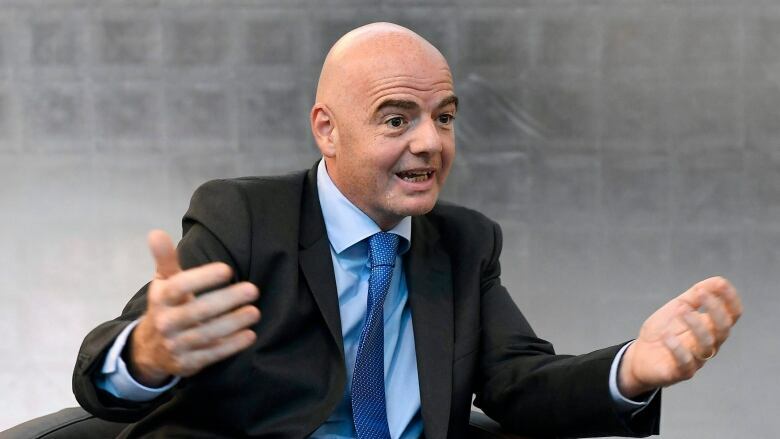 FIFA President Gianni Infantino outlined the idea that would see 16 teams go home after playing just one game in a new opening playoff round. World Cup expansion plans got even bigger Monday, and the 2026 tournament could have 48 teams playing instead of 32. Expanding to 48 means "more countries and regions all over the world would be happy," Infantino said in a speech in Bogota, Colombia. Infantino's suggested format would create a tournament of 80 matches instead of the current 64 — driving up the price broadcasters would pay for rights to the world's most-watched sports event. The FIFA ruling council's decision on the 2026 format is expected within months and is set to be a defining issue of Infantino's presidency before he is due for re-election in 2019. Now Infantino believes that "with 40 teams, the math doesn't work." "You could have a tournament in which the 16 best teams advance to a group stage and the other 16 will came out of a `playoff' ahead of the group stage, and the World Cup could end up with 48 teams," Infantino said at a university in the Colombian capital. How to define the "best" teams could ignite debate if seeding is decided on the merit of recent results, or a national team's historical record at past World Cups. Infantino's previous employer, UEFA, provoked anger in recent weeks by changing future Champions League seeding and prize money distribution rules that favor traditional powers over emerging teams. Staging a World Cup of 48 teams would also add stress on host nations with extra demands for stadiums and training bases. That could favor candidates like the U.S. with existing infrastructure in place, or increase support for Infantino's election campaign idea of regional hosting across multiple countries.